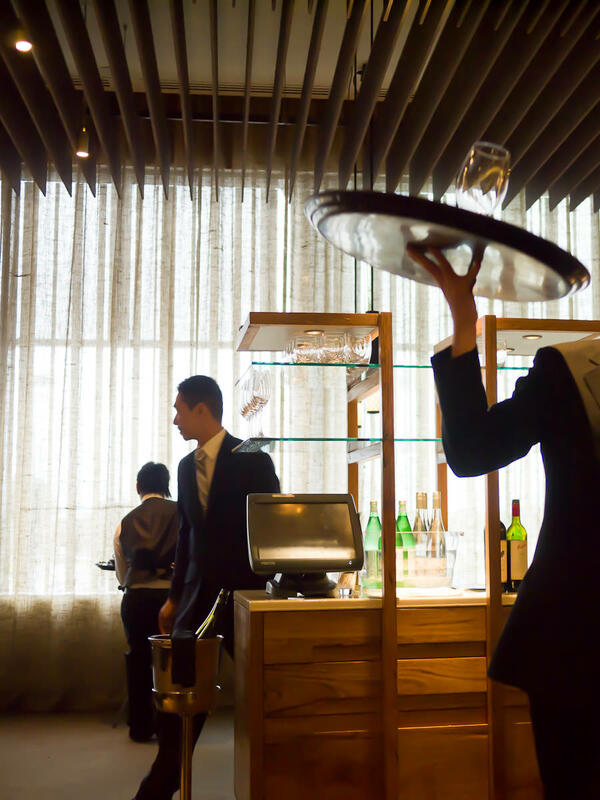 Qantas Frequent Flyer has launched epiQure, its new food and wine online community. I’m thrilled to attend a five-course degustation lunch with Jac at Rockpool Bar & Grill Perth to celebrate the WA launch of epiQure. 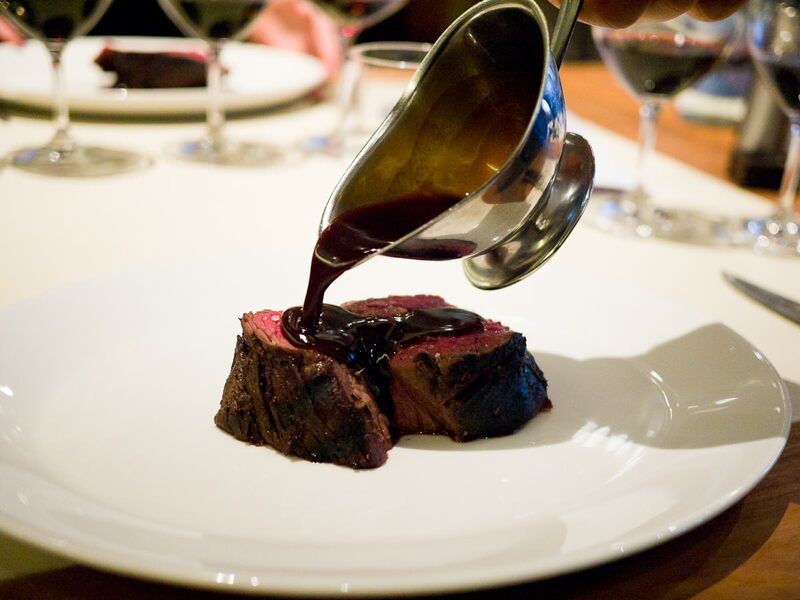 Stepping through Rockpool’s heavyset front doors, we make our way through the corridor past the carnivores’ dream views of the meat-ageing room to join the 80+ guests who are mostly Frequent Flyer members. 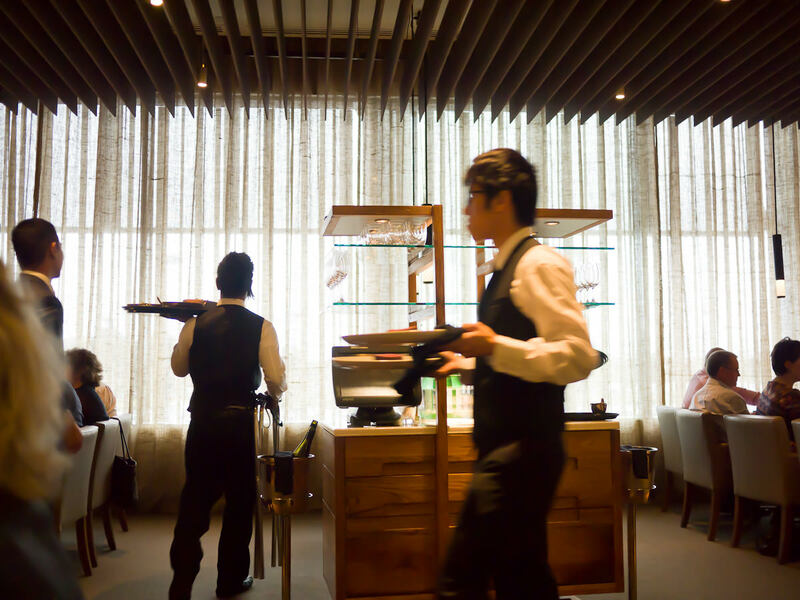 Rockpool is usually closed for Saturday lunch, so the restaurant is exclusively ours for the afternoon. 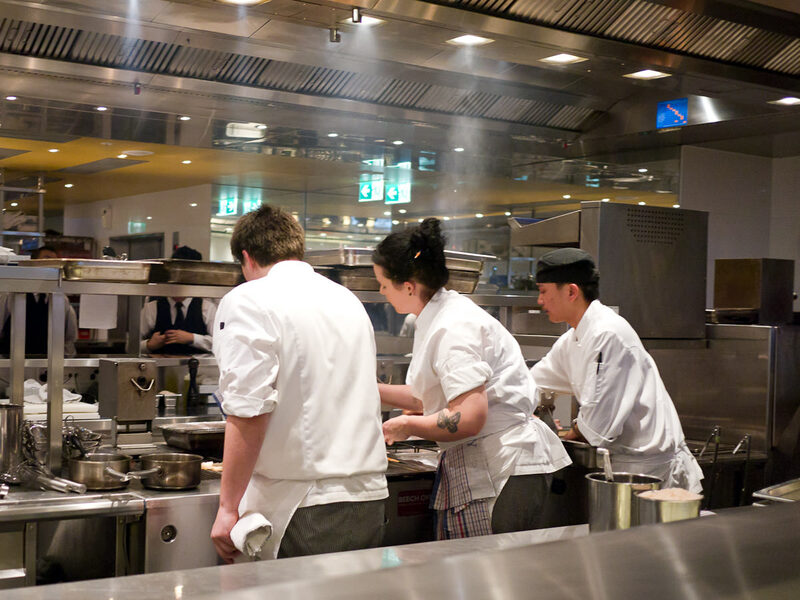 Waiters warmly greet us and offer glasses of sparkling wine but I am distracted and excited by the sight of the chefs busily working in the open kitchen. 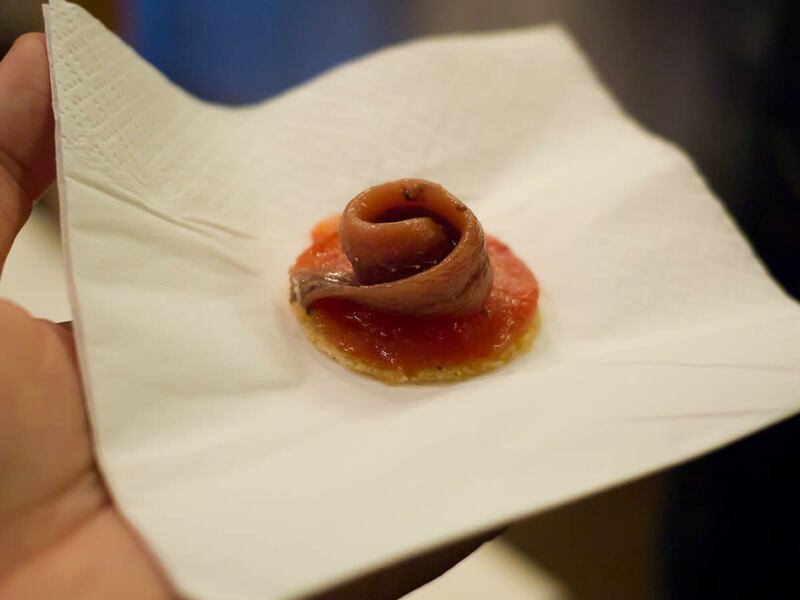 I pay a little more attention when the canapés come around – freshly cooked oh-so-delicate goats cheese tortellini with just a hint of lemon, and intensely salty mouthfuls of anchovies curled on smoked tomato, served on crisp toast rounds. 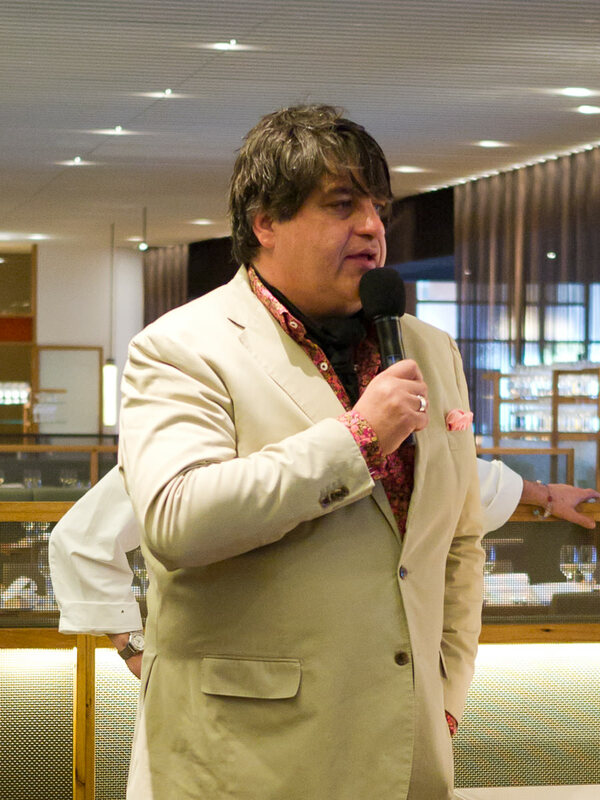 The MC for the event is food journalist, restaurant critic and my favourite of the Masterchef Australia judges, Matt Preston, tousle-haired and imposingly tall, looking ever debonair in one of his signature cravats, floral pink shirt, cream-coloured jacket, white jeans and pointy-toed boots. 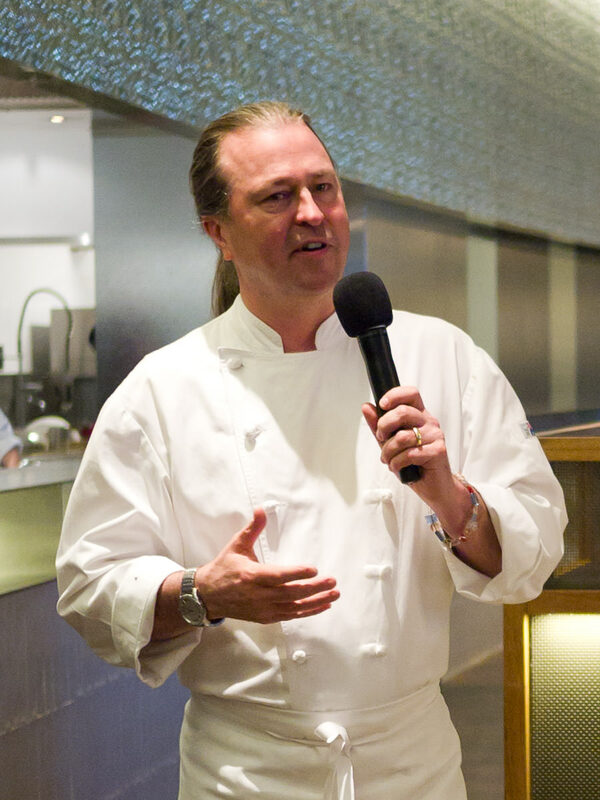 Rockpool owner and consulting chef for Qantas Neil Perry has flown to Perth specially for this event and introduces each course, sharing insights into how he selects his suppliers and sources best-quality produce, making us all salivate in anticipation. 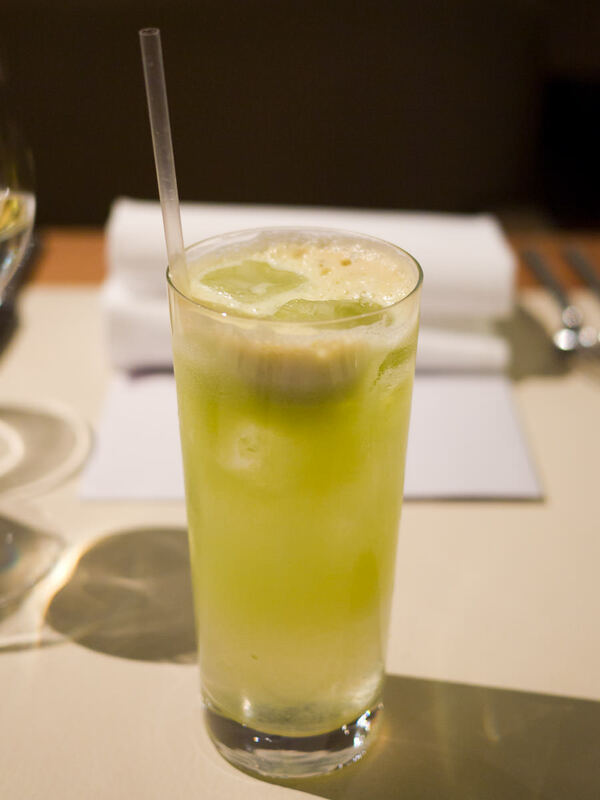 When one of the staff notices I’ve declined the sparkling wine, he offers me a simple but refreshing non-alcoholic combination of fresh apple juice with soda water. After taking a sip of my drink, Jac orders one as well, and soon some other diners are eyeing off our “special” drinks with a mixture of curiosity and envy. We take our seats shortly before the first course is served. 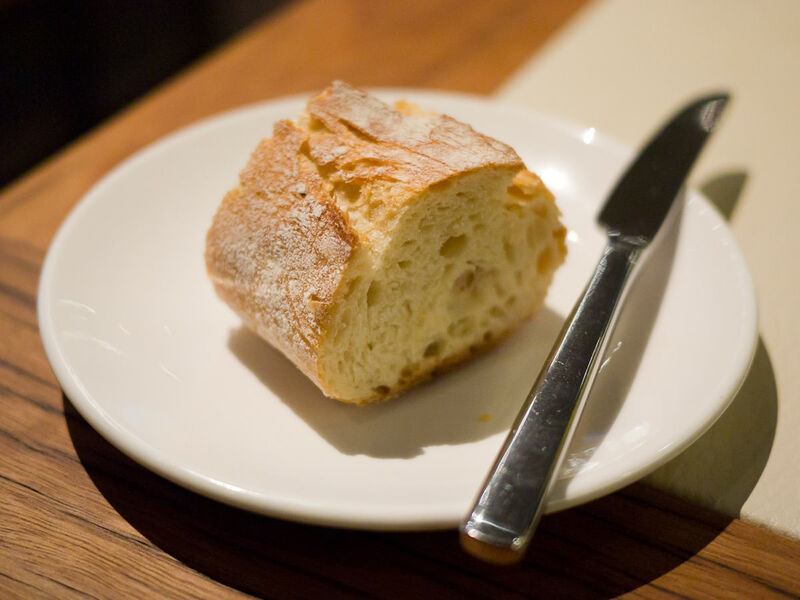 At each place setting, chunks of crispy crusty sourdough bread baked by Perth boulangerie patisserie Jean Pierre Sancho. The crust crackles tantalisingly when I pull it apart with my hands and just for a moment I am torn between devouring this wonderful bread as is… and buttering it first. In the end, the winner is lashings of butter – of course! 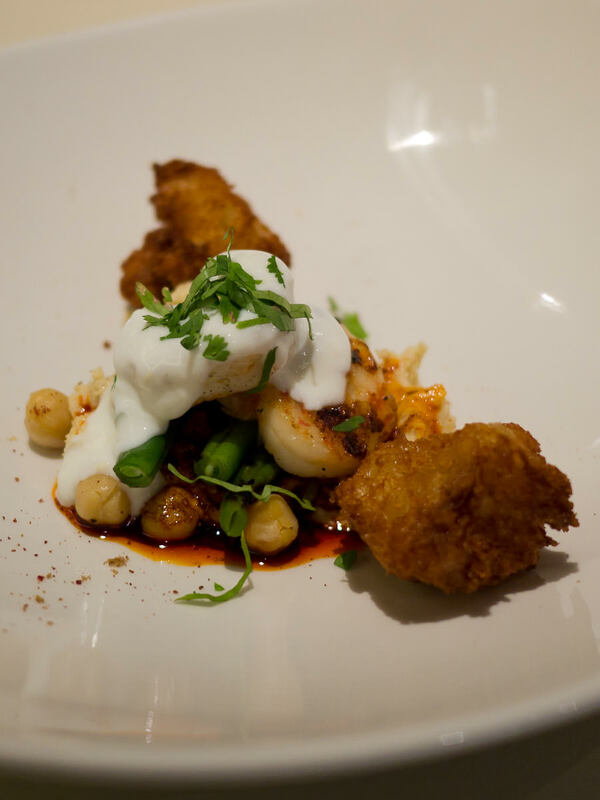 The first course is wood fire grilled king prawns with beans, hummus, croutons and yoghurt salad. The flavours are middle-eastern, with garlicky hummus, tender whole chickpeas and creamy yoghurt. But for me, the real moments of pleasure come when I’m biting into the crispy golden croutons, bursty plump prawns and bright green beans. A fellow diner on our table advises a staff member she can’t eat prawns. 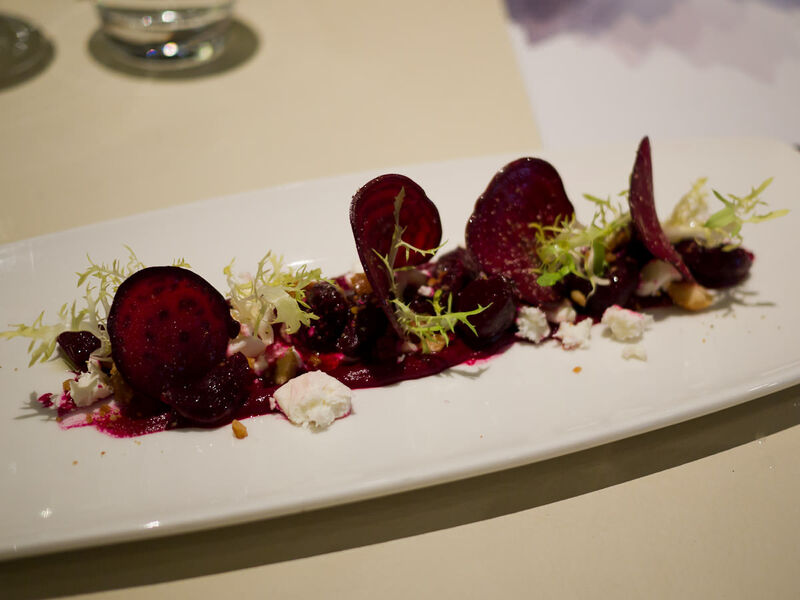 Not a problem; she is served an alternative dish with beetroot, goats cheese and spiky fine frisée lettuce. She’s delighted and tells me it’s delicious. 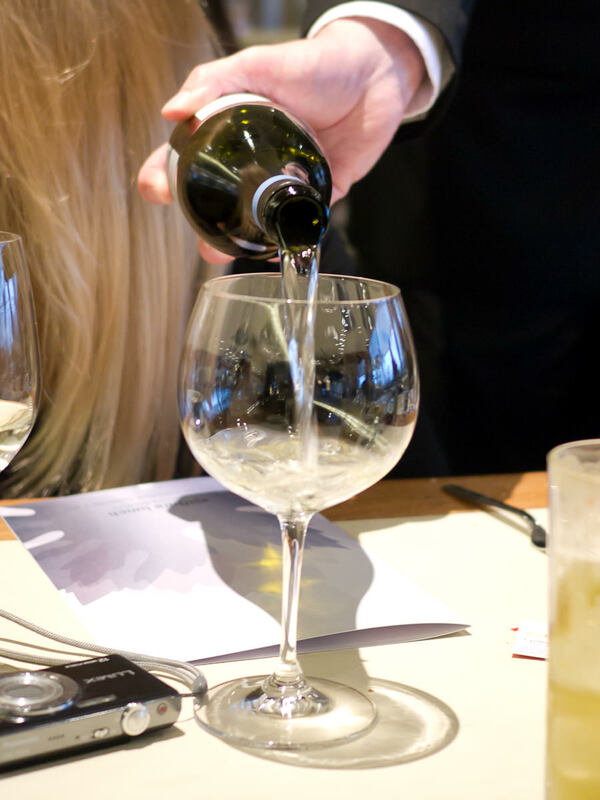 Throughout the lunch, Tom Carson, Qantas wine panel member and general manager and chief winemaker at Yabby Lake Vineyard, tells us all about the wines we are enjoying with our lunch. It’s all rather extravagant, with two matched wines per course – it’s interesting to listen to everyone’s comments on which wines they prefer. The wines served at lunch are on the wine lists for Qantas First and Business Class. Tom talks about the process of selecting wines for Qantas. He tells us that wines taste very different and are harder to smell up while in the air, so it’s a challenge to select the right wines to serve on flights. On our table is Matthew Bealey, joint owner and operator of Partridges, seafood supplier to many Perth restaurants including Rockpool. 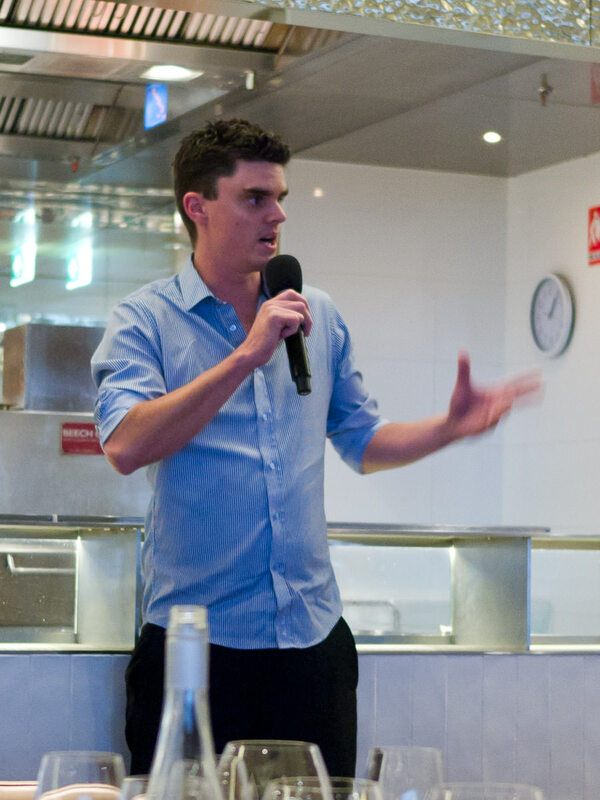 Matthew talks to us all with great passion about the seafood he sources – all sustainable, either farmed or line-caught around Western Australia, with no trawler or net-caught fish. He personally sees and selects the fish every morning fresh off the boats and tells us the squid we are about to eat for our next course was caught the day before near Rottnest and Garden Island. 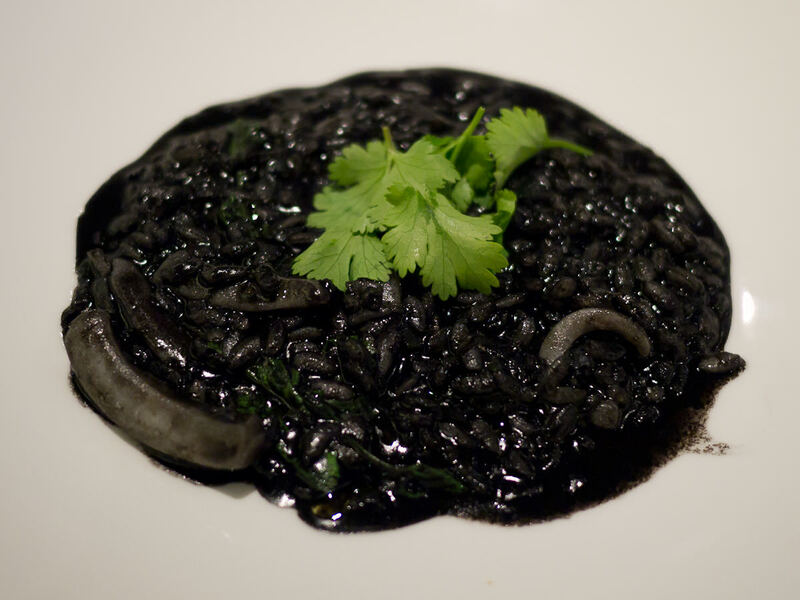 The second course is squid and squid ink risotto with chilli, bacon and coriander. I can’t see the bacon, but I can certainly taste it, and there’s the faintest hint of lemon too. The squid pieces are silky smooth and tender. The spicy risotto is as rich in flavour as it is black. It’s amazing how something resembling tar can taste so beautiful. We laugh at each other’s stained tongues, reminiscent of bobtail lizards (though I’m more chow chow than lizard :)). A couple of diners near me admit to feeling repulsed by the dish’s blackness, but the rest of us unsympathetically urge them to just close their eyes and eat. Have you ever been so put off by the appearance of a dish you wouldn’t even taste it? 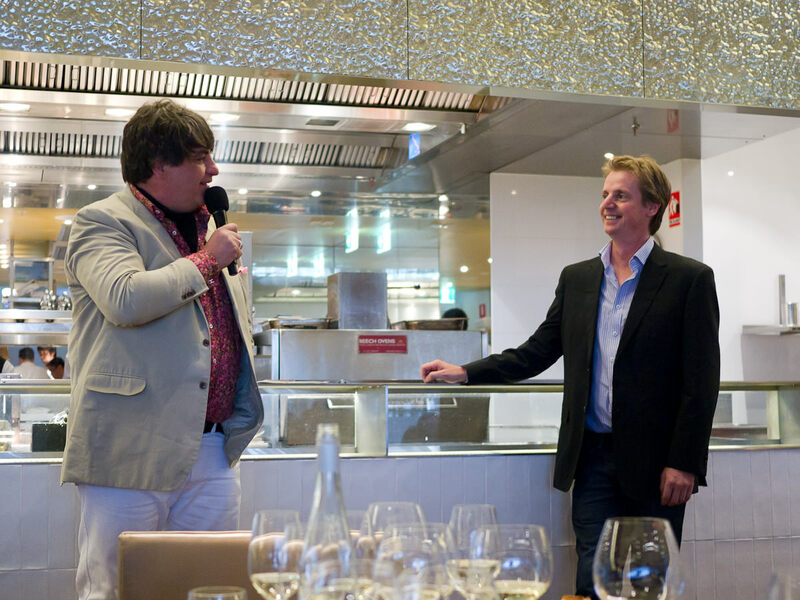 Throughout the meal, Matt, Tom and Neil mingle with the guests between courses, chatting about the food and wine. Neil drops by our table as our risotto plates are being cleared. “Did you like it?” He asks. “I loved it!” I tell him, making him smile. For the next course, Neil tells us we are about to eat fresh Rangers Valley beef fillet that has been slow-cooked at 55C for three hours and finished on the chargrill, which gives the meat a great flavour and nice crust. My tummy does a little flip of anticipation and I know I’m fidgeting visibly in my seat as the waiters begin delivering the beef to tables. The rare beef is served on shining white plates with nothing else but a light sprinkling of salt. 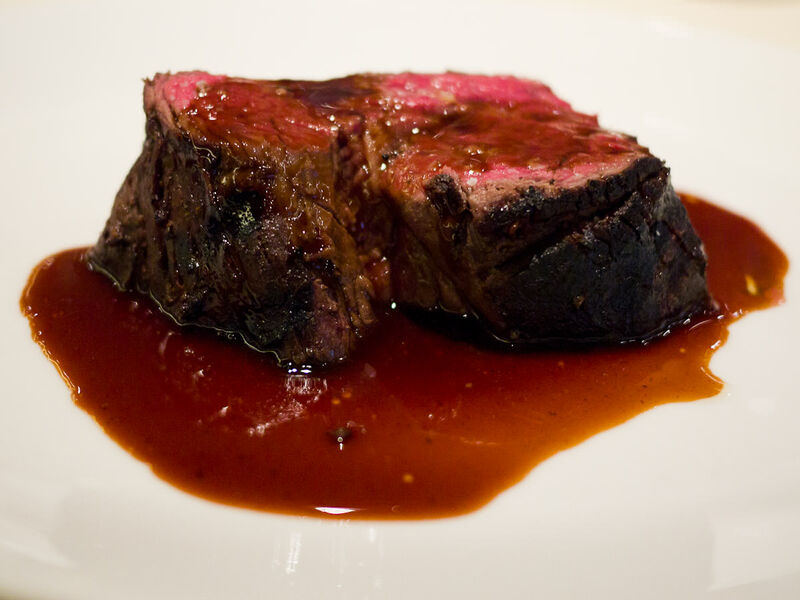 I watch in delight the Bordelaise sauce is poured over the beef. To go with the beef, three vegetable side dishes off Rockpool’s menu. 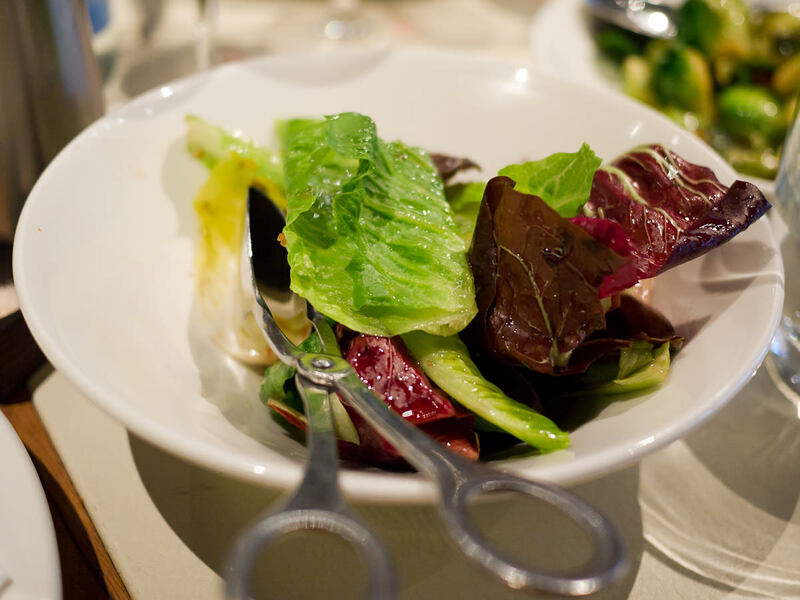 First, a simple crisp leaf salad with radicchio, cos and endive with palm sugar vinaigrette. 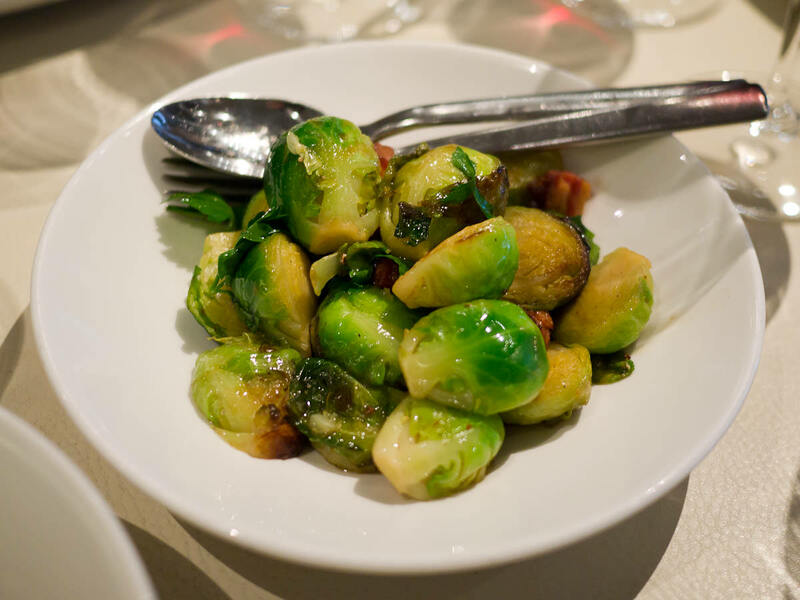 The Brussels sprouts have been sauteed with a magical ingredient: juicy smoked bacon lardons. 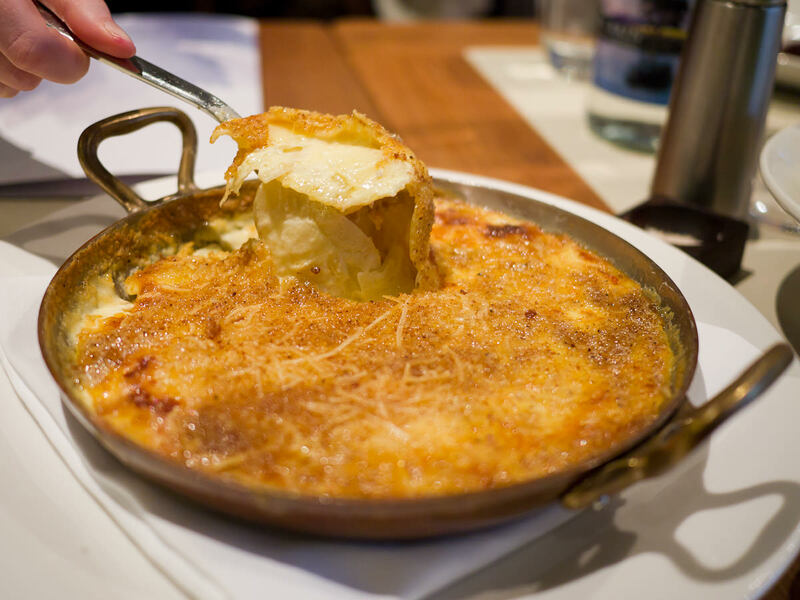 Beneath the potato gratin’s golden crust are perfectly cooked sliced potatoes. The beef cuts like soft butter and tastes of the chargrill. Although I don’t usually eat my beef this rare, I find myself enjoying this tender slab of meat, probably among the best steaks I’ve ever eaten. 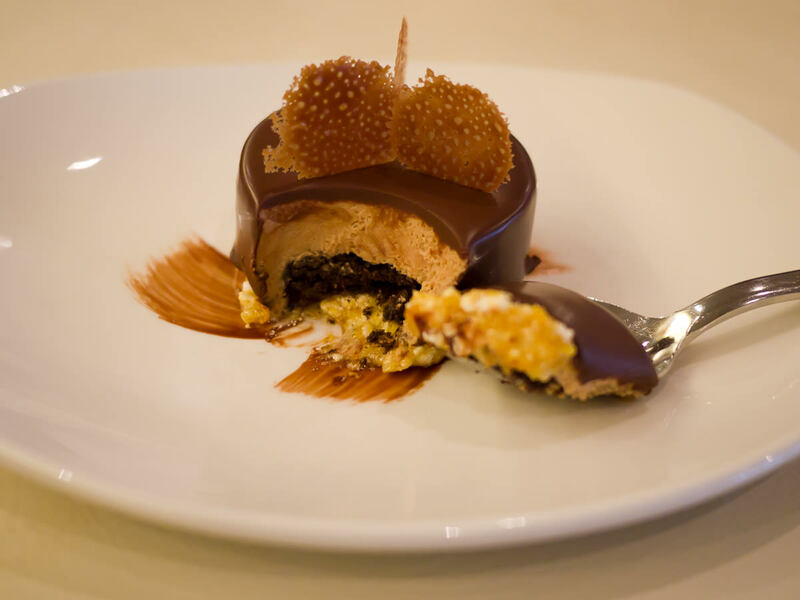 Dessert is Rockpool’s jaffa mousse cake. Each guest is presented with his or her own individual cake that looks too almost too perfect to be spoiled with a plunge of the spoon. 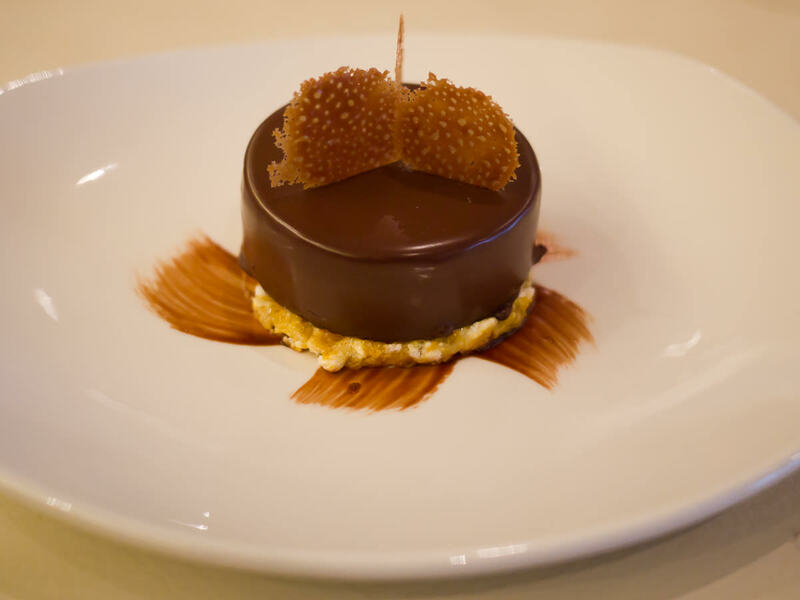 The jaffa mousse is solid yet light, encased in shiny smooth chocolate and adorned with a crown of wafer-thin brandy snap discs. The cake sits on a bed of crumbled meringue and candied orange. It’s decadent, oh so divine and surprisingly, not cloyingly sweet. As waiters stop by to take our coffee and tea orders, more sweet treats are delivered to our table. This elicits both groans and exclamations of delight. 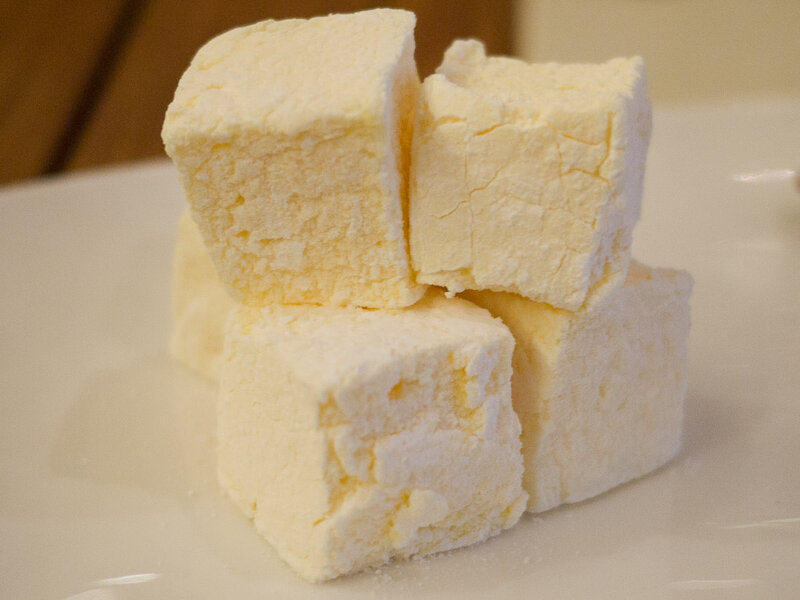 The passionfruit marshmallows are pillowy soft sugar-dusted cubes stacked like building blocks. I want to know if they smell as passionfruity as they taste and end up inhaling sugar instead – that’s not recommended, by the way! 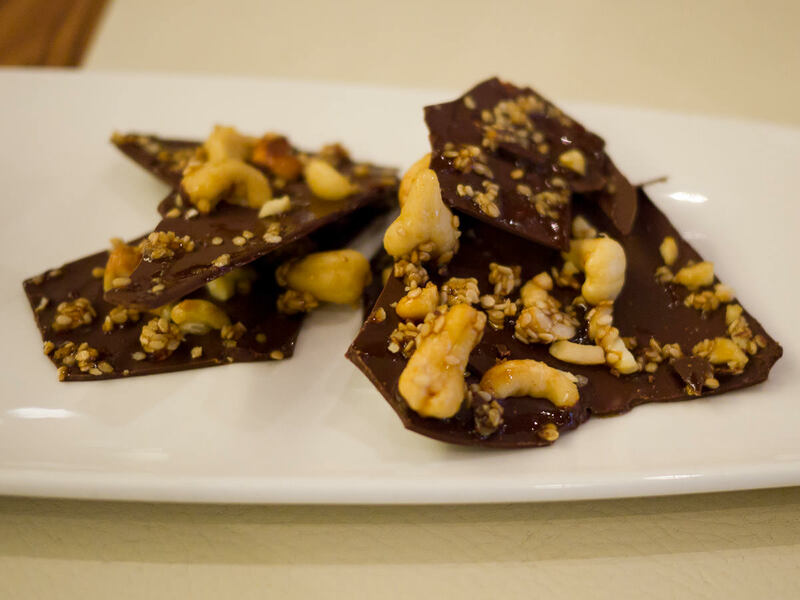 The cashew and sesame chocolate bark is bittersweet and salty. I think it’s too smooth to be called “bark”. 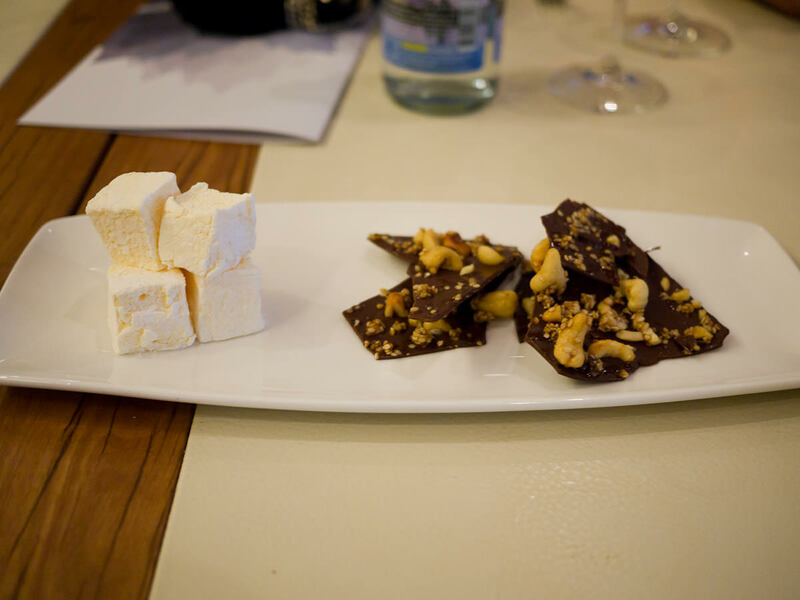 It’s the grown-ups’ treat next to those puffy sweet marshmallows. It’s been a celebration of fantastic food and wine. If this is an indication of the calibre of dining events Qantas epiQure members will enjoy, they have a lot to look forward to. TFP and Jac attended this event as guests of Qantas epiQure. The menu is updated daily and available online. This week, I’m away on my Malaysian eating adventure! Depending on availability of Internet access, I may take longer than usual to moderate and/or respond comments. If (even better) I’m able to get my hands on a prepaid mobile sim that includes data, I hope to keep you updated on Twitter and/or Facebook when I’m out and about. 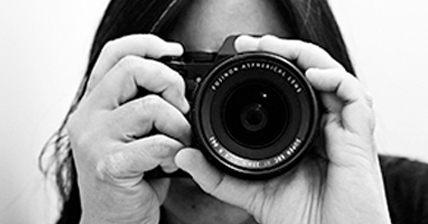 I hope to have lots of photographs and stories to share with you when I get back.